In the 18th century Spain saw an influx of performing musicians and composers from Italy. The most famous of the latter were Domenico Scarlatti and Luigi Boccherini. Italians played a crucial role in musical life around the middle of the century. One of them was Francesco Corselli. He was born in Piacenza, a town south-east of Milan, and was baptized as Francisco Courcelle. His surname sounds French: both his parents were of French origin. His father Charles was dancing master to the Farnese family in Parma and many members of his family were active in that capacity at several courts in Europe. The earliest signs of Francisco's musical activities were the funerals of Francesco Farnese and Antonio Farnese in Parma in 1727 and 1731 respectively. He may also have written the music for these occasions. For the rest of his life he would be connected to a member of the Farnese family. From 1727 to 1733 he was maestro di cappella to the Duke of Parma, the future King Carlos III of Spain, eldest son of Elisabeth (or Isabella) Farnese who was the second wife of Philip V. At her behest he moved to Madrid in 1734 where he was appointed music-master to the royal children. He started to compose operas - most of which have been lost - and villancicos. In 1738 he succeeded Joseph de Torres as maestro of the royal chapel and rector of the Colegio de Niños Cantores (the boys' choir of the chapel). On Christmas Eve 1734 a fire destroyed the old Alcázar and its entire music archive. It was Corselli's duty to re-organise musical life and build up a new repertoire. This explains the large corpus of sacred music which has come down to us: a considerable number of masses, and other liturgical music like Offices of the Dead, sequences, responsories, Vespers, Magnificats and motets as well as villancicos. So far two discs have been entirely devoted to Corselli's output: Grover Wilkins - who also wrote the article about the composer in New Grove - recorded two masses (review). Emilio Moreno recorded extracts from some operas as well as a sacred cantata and two lamentations with the soprano Nuria Rial (review). The present disc makes a substantial addition to what is available. In the liner-notes Joseba Berrocal suggests that the cantatas recorded here are the only extant sacred cantatas for soprano, two violins and bc. They are impossible to date but as King Ferdinand VI, who succeeded Philip V in 1746, abolished the performance of cantatas in Spanish at the court in 1750 - in favour of responsories in Latin - it is probably safe to assume that they were written before that year. The texts are sometimes a little difficult to understand; they are presumably from the pen of the playwright José de Cañizares. Dulze acento, voz Canora has some religious connotations but one would hardly recognize it as a sacred cantata. The same goes for Al Molino venid, finos Mortales. Much more explicit is Si aquel Monarca de Israel. The last cantata is most clearly religious in character. In O qué suerte, mi Dios the protagonist first asks himself why he doesn't embrace the love and care which God offers to him. 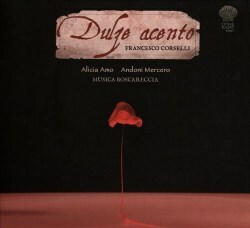 The first aria is the longest on this disc and the most expressive, in a truly cantabile manner, one of the features of Corselli's style of composing. The second aria is the shortest and a real operatic piece, a kind of storm scene. Here the protagonist compares himself with a ship without a helmsman in the middle of a terrible storm. The latter aria is not the only one with a theatrical character. That is pretty much a feature of these cantatas and betray Corselli's operatic credentials. That is underlined by the inclusion of cadenzas in most arias, usually in the da capo but sometimes also in the B section. I am not sure whether in cantatas such as these the cadenzas should be as long as they are here. The instrumental parts substantially contribute to the dramatic character of these cantatas. They are sometimes played in unison; now and then they follow the voice but often they each have independent parts. The structure of the cantatas is always the same: two recitatives, each followed by an aria. The recitatives are rather short but set the tone for the character of the ensuing aria. Alicia Amo sings them with the right amount of rhythmic freedom and obeys the rhythm of the text which in recitatives is more important than the bars. She is also very responsive to the text in the arias. Their dramatic character comes across convincingly. The intimate aria in the last cantata is given a wonderful performance; it is definitely one of the highlights of this disc. Alicia Amo has a beautiful voice; she uses some vibrato which is regrettable but which didn't bother me that much, except in some cadenzas when she sings loudly and her voice starts to flutter. The programme also includes two sonatas for violin and bc which receive an outstanding interpretation from Andoni Mercero. They were written for specific occasions: Corselli composed them for the examination process to fill vacancies at the royal chapel which explains why they are technically challenging. The English translation suggests that these vacancies concerned the post of maestro but the original Spanish text - as far as I am able to understand it - doesn't say that. The Sonata in D dates from 1776 and is one of the latest compositions from Corselli's pen. Juan Oliver y Astorga won the competition and was appointed as violinist in the chapel. The Sonata in d minor is from 1768 and was played by Salvador Resach, a Catalan violinist. It is performed here with only the cello in the basso continuo which seems to reflect the practice applied during the examinations. Alicia Amo and the members of Musica Boscareccia have done a great job convincing the listener that Corselli's oeuvre is well worth thorough exploration.